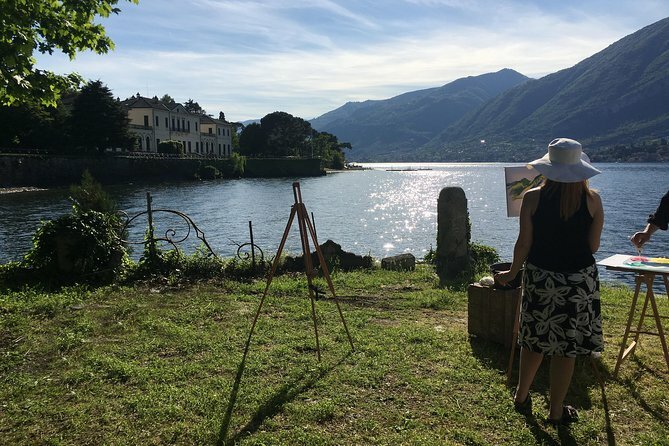 During this unique art experience, you will be able to paint your own masterpiece guided by an Italian Maestro in the placid atmosphere of the lake with spectacular views. Art meets wine during a wine tasting event in the relaxed atmosphere of the lake at the end of the painting session. No matter if you never held a paintbrush in your hand before or if you are a skilled painter, creating your own artwork is about relaxing your soul and releasing your emotions. The train leaves from Milan at 08.20am and arrives at the enchanting village of Varenna after one hour. A 15 minute walk (1km/0,62 miles) takes you to Villa Monastero, a stylish mansion completely furnished and surrounded by a botanic garden with several rare plants generating a true explosion of colours and scents all year round. Get back to the village of Varenna following the lakeshore and reach the harbour to board the boat leaving at 11.23 and taking you to Bellagio in only 15 minutes. Explore the old village or the Villa Melzi Gardens, crossed by many winding paths with Egyptian sculptures and Roman statues that add to the romantic atmosphere of the garden. You will admire many exotic trees and be fascinated by the Japanese pond with water lilies, surrounded by Japanese maple trees and cedar trees. At 02.00pm a person holding a board with the name Stile Italiano Tours will meet you at the Garden entrance of Loppia which is the one opposite to the entrance from Bellagio and together you will reach the nearby hamlet of S. Giovanni to meet the Maestro and be introduced to the ancient techniques, such as the preparation of the egg tempera. In the “bottega” you will create your own colour and then move to the small marina with a spectacular view spanning from Punta del Balbianello to the Bellagio Promontory to create a unique memory in a quiet atmosphere of pure enchantment; the only unexpected occurrence could be an intrigued local taking a stroll and peeping at your work. At around 4.00pm you will reach a winery for a wine tasting experience and your day will end sipping a cool glass of wine in the relaxed atmosphere of the lake.